Majans is a family-owned business and the leading manufacturer in Australia for snacks that are tasty, healthy and wholesome. 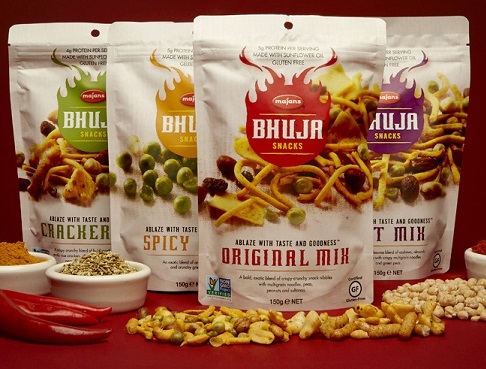 Their core brand is Bhuja – a mix of multigrain noodles, peanuts, peas, sultanas and spices – that is based on traditional recipes. Majans also sells other brands of snack foods, including Smart Snacks, Grain Bites and Cheese Snacks. Majans prides itself on a being a family-owned business with a lot of heart. Their philosophy is that food prepared in a factory should be cooked and prepared with the same love and care that it is cooked in a home kitchen. Majans products are sold in Australia, New Zealand and have recently been introduced to the Americas through the Whole Foods chain of grocery stores. Majans snacks are extremely healthy. They are marketed towards consumers who want snacks that taste great but are also low in fat, have a low glycemic index and so forth. Majans does not use MSG in their products. None of their ingredients are genetically modified. Products are prepared with fresh-press sunflower oil; cooking techniques minimize oil absorption. Colours and flavours are all natural. Recipes have been honed and perfected throughout the company’s five decade existence. The company started in 1960 in Ba, a small town in the Fiji Islands. Confectionary and spice products were sold on the street from carts. In 1980, a top of the line manufacturing plant was commissioned to create snack foods, including bubble gum and chocolate. In 1984, the company made their products available in Australia, using the city of Sumner Park, Brisbane as a base for operations. Once in Australia, Majans began selling Bhuja , a traditional snack, in 1987 Majans was the first company to sell this traditional snack food commercially. Their range of Bhuja snacks became very popular and remain so to this day. In 1992, the company worked with the giant food corporation Nestle in a venture in Oceania. In 2004, the Bhuja line was repositioned and made an international product. Majans is snackfood company from humble origins which is now international. They combine the warmth and tradition of family-owned business with the sophistication and reach of a major food corporation.